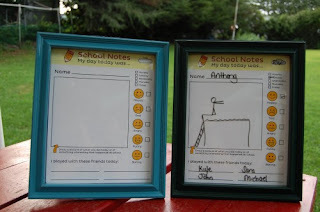 If you are tired of your kid answering “fine” when you ask about their day, then hopefully these school notes will help them to open up a bit more! Free Back To School printable school notes. Look at the genius idea a reader came up with for her kids! Athena spray painted frames, inserted the school notes and is using a dry erase marker each day.